Airport abbreviations: How Los Angeles became LAX and Dulles IAD. 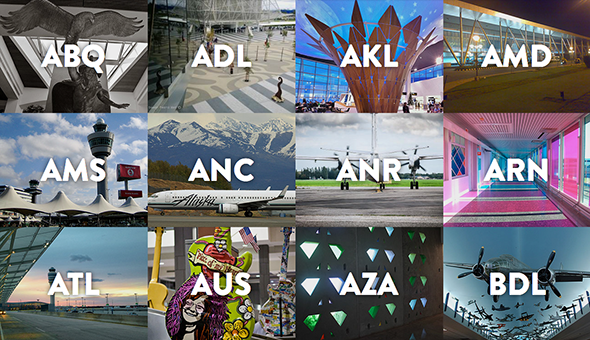 The strange stories behind airports’ three-letter abbreviations. When booking flights online, knowing your local airport’s code can come in handy. There’s 3,000 miles’ difference between BUR (Burbank, California) and BTV (Burlington, Vermont). And you probably don’t want to end up in Venezuela just in time for Oktoberfest (Munich’s code is MUC, not MUN). Those enigmatic three-letter signifiers that help you search for flights on Kayak or Priceline are doled out by the International Air Transport Association, and distinguish airports from one another. But the average traveler may not know where those letters come from. Renamed and officially opened in 1974, France’s largest airport is named after Charles De Gaulle, former president and founder of the French Fifth Republic. Soekarno–Hatta International serves the capital city of Jakarta and honors Indonesia’s first president and first vice president. It receives its code from the CenGKareng district in the city of Tangerang, where it’s located. Serving the greater Cincinnati metro area, Cincinnati/Northern Kentucky’s airport code comes from the nearby city of CoVinGton. When Dubai International opened in 1960, the airport code DUB was already in use by Dublin. DuBai subbed an X for the U, making its unique airport code of DXB. When airport codes switched from two letters to three, the Navy reserved all codes starting with N. NEWaRk, then, used the other letters in its name to make EWR. Dulles International Airport, Washington, D.C.
Dulles International Airport’s three-letter code was once DIA. When handwritten, it was often misread as DCA, another Washington airport. It was reversed to IAD to avoid confusion. London HeathRow takes its name from Heathrow, a hamlet northwest of where the then-small airfield was started in 1929. Kahului Airport is named after its home city, but its airport code honors Hawaiian-born pilot Bertram J. HOGG. Before the airport was renamed after Medal of Honor recipient Edward O’Hare in 1949, it was known as ORcharD Field Airport. When codes switched to three letters from two, many added the letter X to the end. San FranciscO instead used its last letter O.
Mariscal Sucre International is named after Antonio José de Sucre, who fought for the independence of Quito, in what is now Ecuador. Because the Federal Communications Commission reserved codes starting with Q, it opted for other letters from its home city of QUItO. Airport codes starting with Y designate Canadian airports. The YZ isn’t as clear but is said to be the old railway station code for Malton, an area west of Toronto where the airport is located. For more airport codes and their origin stories, visit airportcod.es.